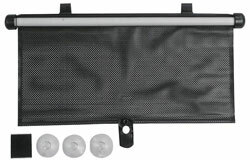 Roller Shade protects your baby from harmful UV rays, glare, and heat. Its unique, lightweight solar mesh fabric is a full 19" wide and adjusts to any length up to 14". Shade rewinds with the touch of a button so it's up and out of the way in a flash. Attaches securely to any window with clips or super-strong suction cups. Stops and Stays where You Put It!